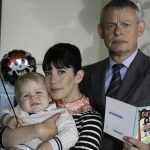 With the new series of the hit comedy drama, Doc Martin, set to return tomorrow (Monday, 12 September) on ITV1 in the UK, it’s time to set up yet another support group in the U.S. Unfortunately, as we have recently reported, series 5 will not premiere in the States until April 2012 on public television stations. Why the lag time? I wish I had an answer. In the meantime, here’s a quick look at what’s in store for the ‘lovable’ Dr. Martin Ellingham come tomorrow in the UK and down the road in the U.S. For those on both sides of the pond, a bit of a quick refresher course since we last left the Doc…. Bags packed and ready to take on a consultant’s position in London. Bags packed again. How will the Doc cope with being a new dad while trying to resume his high-flying career as a surgeon? An interesting side note regarding the premiere of Doc Martin 5 on Monday. We’ve all heard about the big battle set for Sunday, 18 September, in the UK with the BBC placing the final series premiere of Spooks 10 up against the premiere of ITV powerhouse Downton Abbey 2 at 9:00pm. A definite departure from the 9 seasons that Spooks has been transmitted on Monday evenings quite successfully. Seems odd that you would move a brilliant series such as Spooks up against the likes of the return of DA2 that is sure to draw huge numbers, but word on the street is that there is more of a concern on the part of the BBC about going up against the return of Doc Martin, after a 2-year hiatus, than there is about Downton Abbey. Bodes well for all three shows in the U.S. as viewers won’t have to make a choice when all three premiere on public television stations in 2012. It’s going to be a great year for drama (action, period or comedy) on public television….let’s not forget to add Sherlock 2 into the mix. 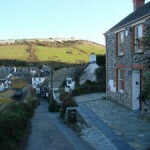 I can’t possibly wait till April 2012 to see series 5 of Doc Martin in the States! Can’t someone put it on You Tube when it aires in the UK today?? Or isn’t there a Spy network who will show it to us?? good things come to those that wait trust me it is worth waiting for . Its funny and brilliant but it is worth the wait. @Charlotte: Thanks for the reassuring words. U.S. broadcast will not being until April 2012, but from what I’ve seen, it’s definitely worth the wait. Thanks for stopping by Tellyspotting. Beautifully done program in every way. When will Series 5 be available for purchase in the USA? My Daughter and I have watched every episode of Doc Martin as they are available here in Canada. Delighted to have the opportunity to view the latest series being shown now in 2012. Excellent cast of actors! Please keep Doc Martin filming as long as possible. Martin Clunes is absolutely a fine actor and we truly are entertained every minute of the show. A magnificent ‘setting’ great village stories, ‘thank you’. I am a proud American but not so proud of most US tv offerings, just plain boring with nothing but glossy manequins standing around holding wine glasses, guns, etc. Poorly written plots – PLEASE bring us Doc Martin season 5! I am totally crazy about DM!! I have all the DVDs currently available. Smart comedy!! Mrs. Tishell cracks me up! Can not wait!!!! I absolutely love the Doc Martin series. I am an American grandmother who feels part of the Portwenn community. I can’t wait to see Series 5 in April. What a wonderful show! Makes me want to laugh and cry every scene not to mention visit Cornwall area. Please keep the Doc Martin series going. I live in the states and just love the show!!! !